The first insider account, timed to the 75th anniversary of Camp David Camp David is American diplomacy's secret weapon. The home of the 2015 GCC and 2012 G8 summits, the 2000 Peace Summit, and the 1978 Peace Accords, the camp has played a vital role in American history over the past century, inviting Presidents and international leaders alike to converge, converse, and, perhaps most importantly, relax. A peaceful mountaintop setting, crucially removed from the constant scrutiny of the press, Camp David has served as both a site of critical diplomacy and unparalleled tranquility. It is where President and Mrs. Reagan rode horses through the mountains, where Gerald Ford could take a moment to jump on a trampoline with his daughter, where Nixon rode shotgun with Soviet President Leonid Brezhnev, and where Jimmy Carter could find the ultimate flight-sledding-only to break his clavicle two weeks before the end of his tenure. Under the pressure and stress, it is easy to forget that those occupying the highest seat in the land are, at the end of the day, human but at Camp David, we finally get to see these leaders at their most vulnerable, their most unguarded, and as their most true selves. Camp David is American diplomacy's secret weapon. The home of the 2015 GCC and 2012 G8 summits, the 2000 Peace Summit, and the 1978 Peace Accords, the camp has played a vital role in American history over the past century, inviting Presidents and international leaders alike to converge, converse, and, perhaps most importantly, relax. A peaceful mountaintop setting, crucially removed from the constant scrutiny of the press, Camp David has served as both a site of critical diplomacy and unparalleled tranquility. It is where President and Mrs. Reagan rode horses through the mountains, where Gerald Ford could take a moment to jump on a trampoline with his daughter, where Nixon rode shotgun with Soviet President Leonid Brezhnev, and where Jimmy Carter could find the ultimate flight-sledding-only to break his clavicle two weeks before the end of his tenure. Under the pressure and stress, it is easy to forget that those occupying the highest seat in the land are, at the end of the day, human but at Camp David, we finally get to see these leaders at their most vulnerable, their most unguarded, and as their most true selves. 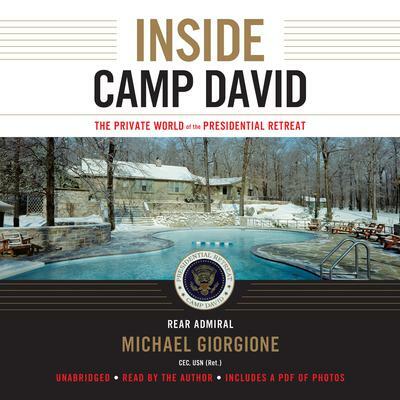 Having served as commanding officer at Camp David during the Clinton and George W. Bush presidencies, Rear Admiral Michael Giorgione brings listeners inside the gates. With a soft, dignified voice, he reveals why this storied presidential getaway is equally suited to hosting consequential summits and jovial first family gatherings. Although celebrated for solitude, Giorgione clarifies that Camp David’s indispensability resides in the relationships forged there.